Characters :: House's T-shirts, shoes, etc. 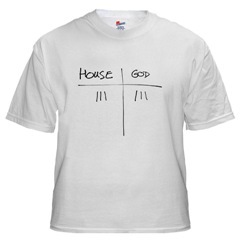 Also see T-Shirts Available about House. See below for the fourth season. Editor's note: to the right is a T-shirt House would never wear but his fans might and other such shirts are also available. Also see other T-shirts, etc. about House. 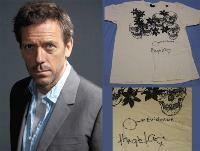 December 19, 2008: Will T. sent us a link to a site that he says "goes over all the shirts (and shoes) that House has ever worn on the show." From what we have seen that might actually be right. House's look is planned by Cathy Crandall, the show's costume designer. "House's rock-and-roll tees may look ratty but they're actually desinger orignals by the likes of Barking Irons and Lincoln Mayne. They retail for nearly $100." ...seems like most of them involve pain or death." August 29, 2006: "FlipFlopsSox" posted on the Television Without Pity's House Forum "Barking Irons is one brand of tshirts that House wears." "I remember an article/interview where Katie Jacobs (I think) said that they had found this little company that sells vintage shirts and reproduces them as well (if I remember correctly). TV Guide had a blurb in May where they mentioned that the brown 'Old South Clothing House' shirt was available for $55 from Buckley (but not anymore)." Lincoln Mayne is the designer, and you can buy the same kind of shirt (for $68) here. and of which "Yadi" posted a screen cap of. 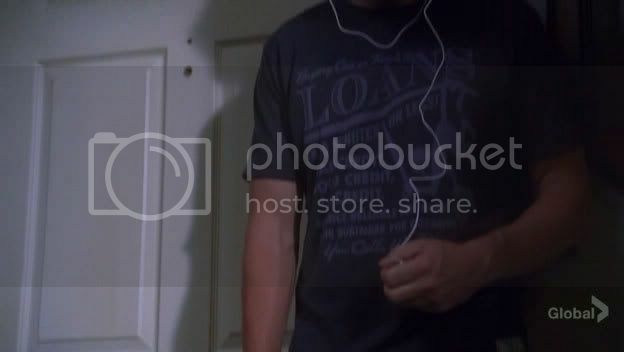 September 28, 2007: in #401 "Alone" House wears a OmniPeace t-shirt with an emblem of Africa on it.